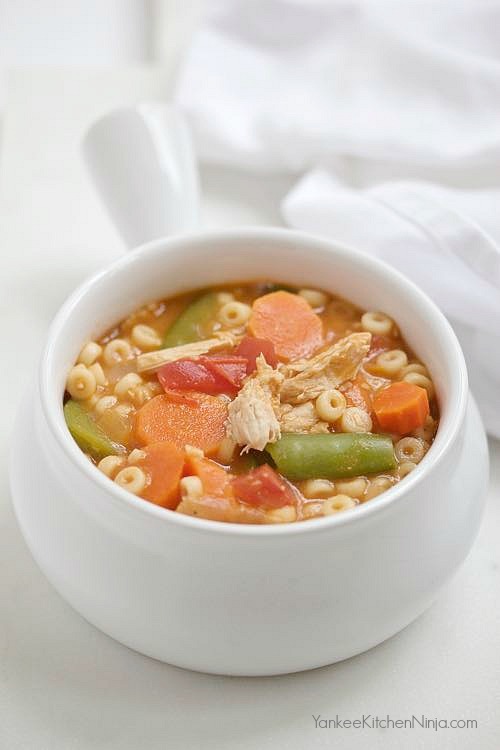 Whenever I make a roast chicken (usually on the weekend), I always plan to make later in the week a soup like this one that calls for shredded cooked chicken breast. It's a great way to get two meals from one. I love the one-pot-meal nature of this hearty dinner soup. Packed with good-for-you veggies, it allows me to be super lazy and skip making a side salad, without feeling guilty. But I never skip a crusty loaf of french bread to go with it. And neither should you. 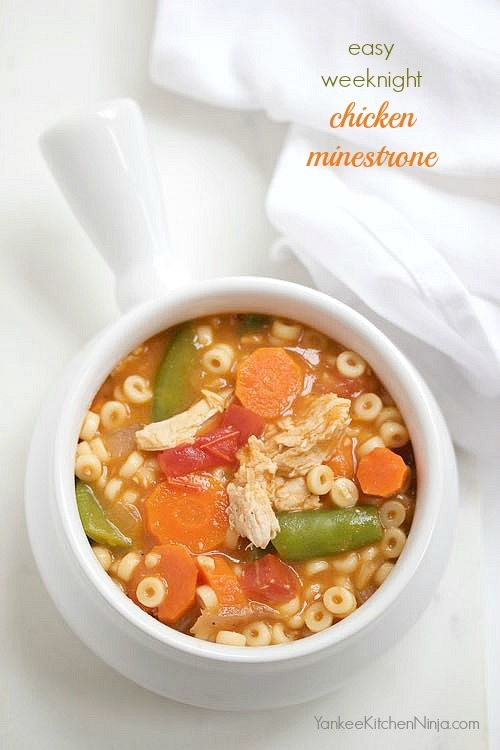 Do your thoughts, too, turn to warming, hearty soups like minestrone in the fall? Leave a comment: The Ninj wants to know. Heat a glug of oil in a soup pot over medium-high heat. Add onion and carrot and saute about 5 minutes, add the garlic and tomato paste and cook, stirring frequently, about 2 minutes. Next, add the stock and water and bring the mixture to a boil. Then add the pasta and cook for 5 minutes. Lastly, Add the chicken, peas and tomato and cook for another few minutes until thoroughly warmed. Season to taste with salt and pepper. I've always been a fan of veggie soups, and this one looks so light and delicious. We're still having summer temps here, but maybe if make some of this yummy looking soup it'll seem more like fall.